Pre-filing for the 86th regular session of the Texas legislature began Nov. 12. Although pensions aren't expected to be the focus of the legislative session, a few bills are looking to strengthen benefits for retired educators. As of Nov. 14, House Bill 56 by Rep. Armando Martinez, D-Weslaco, would establish cost-of-living adjustments on pensions for retired teachers. Also, Senate Bills 92, 93 and 94, all authored by Sen. Jose Menéndez, D-San Antonio, would add a supplemental “13th payment” for retirees and otherwise shore up the Teacher Retirement System, according to an update provided by TEXPERS' lobbying firm, HillCo Partners. By end of day Nov. 12, legislators filed more than 400 bills. A sampling of the legislation propose raising wages, strengthening workplace benefits, expanding health care and improving access to higher education. Several measures address the problem of sexual harassment. Capital insiders see costs related to Hurricane Harvey and disaster recovery, school safety, local property taxes, mental health, and public school funding among the session's top priorities, however. The general election brought about transition at the Congressional level and the Texas legislature. Nationally, Democrats took control of the House in Congress turning at least 25 seats from Republican to Democrat but lost a few seats in the Senate. The outcome from an unprecedented voter turnout in a midterm election resulted in a split Congress. In the Texas legislature, the Senate saw two incumbents lose their seats bringing the 31-member Senate to 19 Republicans and 12 Democrats. The Texas House will have 12 new Democrats bringing the 150-member body to a 67 Democrat and 83 Republican membership (at the time of this writing). At the federal level, several races and candidates received voter and media attention rare for a midterm election cycle. The race between incumbent U.S. Sen. Ted Cruz, R-Texas, and Democratic challenger Beto O'Rourke captured national attention and created voter enthusiasm in Texas. Ultimately, Senator Cruz defeated his Democratic challenger by 3 points. Along with the national dialogue, the Cruz-O'Rourke race was a cause for the projection of a larger voter turnout than in prior midterm elections. Two Republican held Congressional seats, Congressional District 7 from the Houston area and Congressional District 32 in suburban northeastern Dallas, switched to Democrat. Going into the general election, the Texas Legislature had 94 contested House races and 13 contested Senate seats. After votes were counted on election night, 12 House Republican seats went Democrat, with 2 seats in the Texas Senate being won by the Democratic candidate. Republicans still maintain control of the Texas Senate and House. However, the gain by Democrats in the House provided an appreciable impact to the most critical function that occurred the first day the 86th Texas House convened: electing a speaker. With Speaker Straus announcing his resignation, the speaker's office became an “open seat,” something that has not occurred in over a decade. Rep. Dennis Bonnen, R-Angleton, received enough support from House members to become the next speaker. When legislators convene in January, several policy issues will need addressing, which may shift their focus from local public employee pensions. “Public pension issues may not have the focus the likes of which were on the table during the 85th session,” says Eddie Solis, who represents TEXPERS as a lobbyist with HillCo Partners in Austin. During the 85th interim, House and Senate committees with jurisdiction over pensions received updates regarding the pension reform legislation passed last session and the state's Pension Review Board has continued discussing remedies local plans are proposing as required by Funding Soundness Restoration Plans to resolve issues identified by both the pension system and respective sponsoring entities. The PRB continues to research how local plans are working with their respective cities to address funding issues. TEXPERS continues to track political happenings that could impact pensions at the state and federal level. 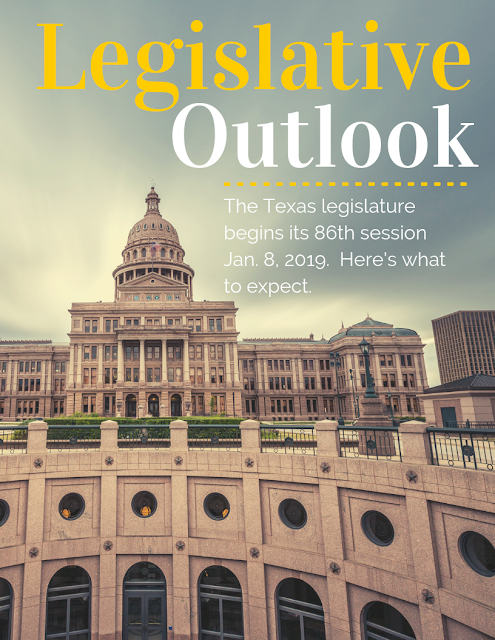 Members may log in to their member portals at www.texpers.org for legislative updates throughout the 2019 session.